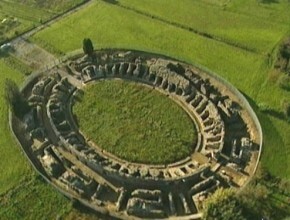 Ancient city Roman situated on the border between Liguria and Tuscany, including the City of Ortonville. 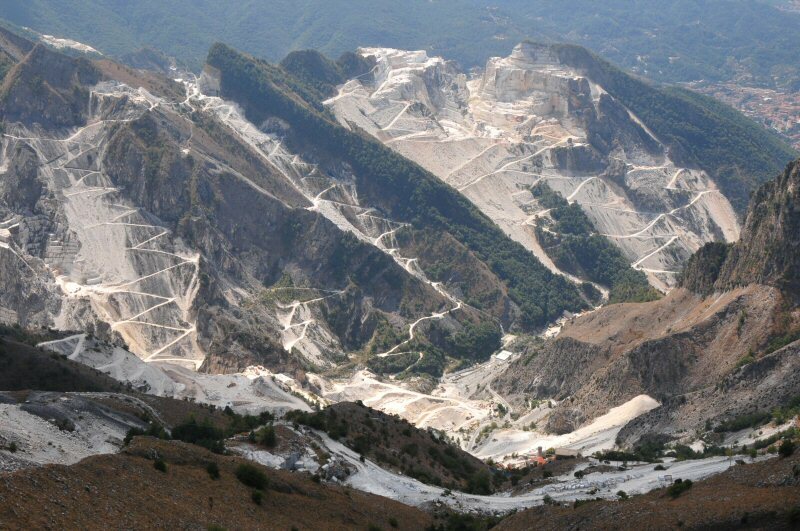 This town ‘was founded at the beginning of the second century A. C. and during the Roman Empire, its harbor was busy with ships laden with marble from the Apuan Alps. 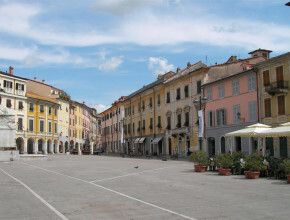 Sarzana, a municipality in the province of La Spezia, is situated at the end of the valley of the Magra River, a few kilometers from the estuary of the river. The city still retains the image of the original medieval town, despite the later works of fortification due to the interventions of fortifications. Sarzana makes tourism one of the main resources of its economy.. 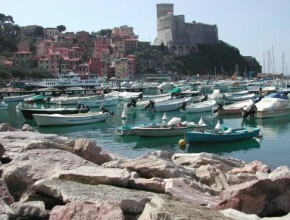 The territory of Lerici is situated in the Riviera di Levante , on the eastern shore of the Gulf of La Spezia. It is located at the center of a small natural bay of Lerici called Breast and dominated by a headland on which stands the imposing castle , now a museum . Lerici still retains its original medieval structure , with the characteristic houses lining the narrow alleys. Inside the village are interesting Jewish Quarter of the ghetto, the castle, built by the Pisans in the thirteenth century and expanded by the Genoese , inside the thirteenth century chapel dedicated to St. Anastasia and the geo- paleontological museum and squares of the Poggio and St. George . At the foot of the castle is the relaxing stroll on the boardwalk Vassallo . In the village there is also the tower of San Rocco, from Roman times, converted into a bell tower in the sixteenth century , the parish church of St. Francis of Assisi , the Oratory of San Bernardino and near the Palazzo Doria , an ancient medieval hospital dedicated to Saints Peter and Paul. 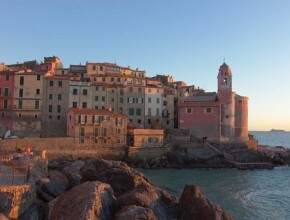 Lerici , however, is not only his village . In its territory , stand other locations , such as San Terenzo , with the castle , Villa Magni , inhabited by Percy Bysshe Shelley and Mary Shelley, and Villa Marigola , where you can enjoy a wonderful view of the beach of Venere Azzurra . 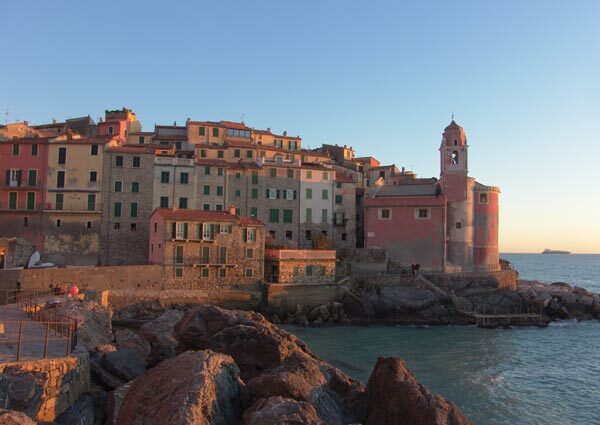 A Tellaro instead , a typical fishing village, where you can still meet the boats in the square by the sea , there is the ‘ old church of St. George and the oratory of Santa Maria in Sela . Among Pugliola and you can admire Villa Solaro Cochrane , better known as Rezzola villa , surrounded by a park of eucalyptus , oaks and cypresses. And yet La Serra and Pozzuolo , on a hill of olive trees, the Senate, green oasis of silence and Solaro , a small village overlooking the Gulf . An area where land and sea merge to form a single area and evocative. Eighteen miles of rocky coastline full of bays, beaches and deep, dominated by a chain of mountains that run parallel to the coast. Terraced vineyards and olive trees, which containment is provided by ancient stone walls. A natural heritage of great variety. 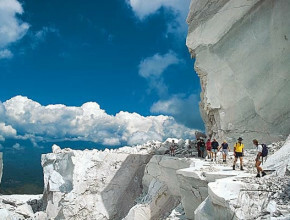 Walking paths and trails with breathtaking views. 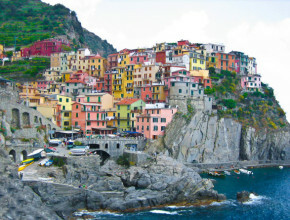 Five villages: Monterosso al Mare, Vernazza, Corniglia, Manarola and Riomaggiore overlooking the sea. Eighteen miles of rocky coastline full of bays, beaches and deep, dominated by a chain of mountains that run parallel to the coast. Terraced vineyards and olive trees, which containment is provided by ancient stone walls. Forte dei Marmi, with its local shops and high-class is able to select an elite tourism and is one of the most exclusive and fashionable tourist destinations in all of Italy. 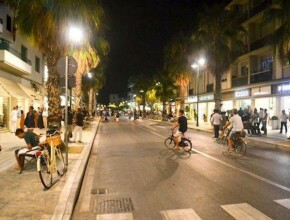 The entire town of Fortedeimarmi is known for its exclusive stores and shops. 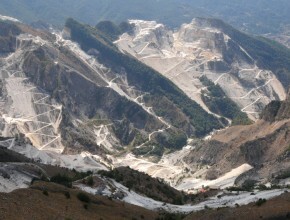 The visit to the three marble basins of the marble quarries of Torano, Fantiscritti and Colonnata is unforgettable and unique: along the route of the former Marble Railway, visitors perform a spectacular journey passing on Ponti di Vara and within striking tunnels dug into the rock , to explore the cave from which since the pre Romanesque was extracted from white Carrara marble. Imperial age the blocks were transported downstream into the percioloso lizzatura method and marble reached the port of Luni along the Via Carraia on carts pulled by oxen. It ‘a particularly attractive destination for cultural tourism and elitist. 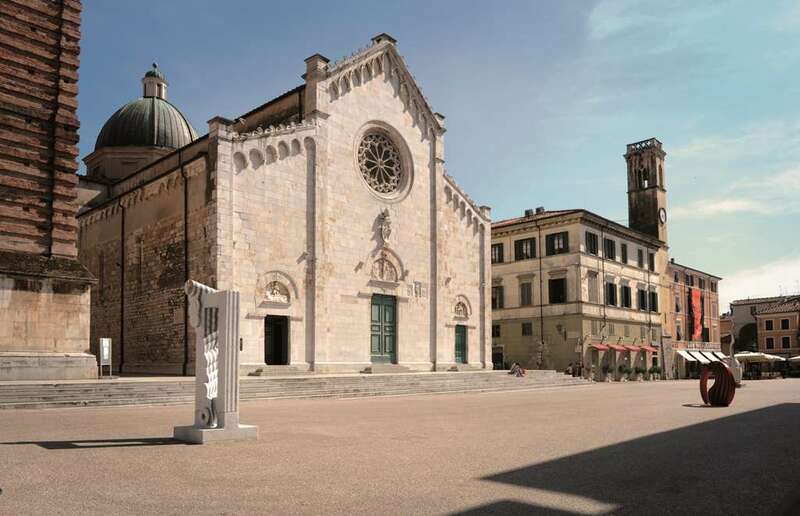 Pietrasanta, the little Athens of Versilia, which is defined as the concentration of artists who have decided to stay there, has ancient roots in marble. 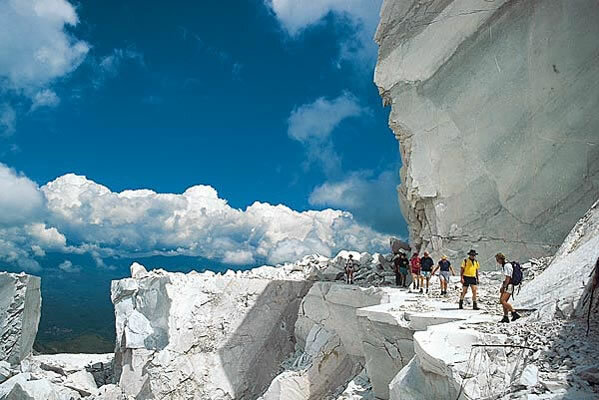 To remember are the imposing peaks of the Apuan Alps which stand out against the background. And it breathes the air of Michelangelo in the old town of laboratories, including the ancient Studio Cervietti, Via Sant’Agostino, where it is not unlikely to encounter artists like Botero, Mitoraj or Gina Lollobrigida for several years given the art of sculpture. The elegant old town, where you chase the art galleries, designer boutiques, fashionable and prestigious wine. A few kilometers, Marina di Pietrasanta, here opens the kaleidoscopic curtain of Versilia, holiday resort much loved by the poet. 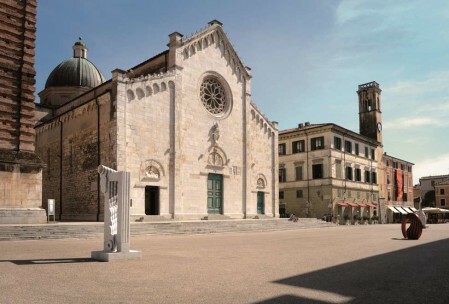 Do not miss a trip to Colonnata, where it is magnificent lard, a typical product that has finally obtained the DOP mark, is a must for those who choose to stay in Pietrasanta, as well as the visit of the capital city, Lucca, with its elegant historic center held tight, flared from the walls. The central Via Fillungo and Piazza San Michele with its Minster, represent the classic episodes, but the most pretentious visitor does not lose past the opulent villas in the neighborhood, including the Villa Reale, now Peci Blunt, Villa Mansi and Villa Torrigiani.